Maintaining the look of your garden is difficult throughout the year. Whether you're away on a cruise for a few months of the year or you've begun to find it hard to maintain your whole garden, you'll want to find a professional team who can help. At Nightingale Ground Care we have a vast array of experience and a team of landscapers waiting to take on board your challenges. Weed control: Keeping your garden looking fine throughout the year requires effective control of weeds. There are plenty of ways to do this, but our service helps to ensure it doesn't return easily. Tree surgery and services: Making sure that your trees and shrubbery look good and don't stop light entering your property is vital. Our team will provide you with a professional tree surgeon service. 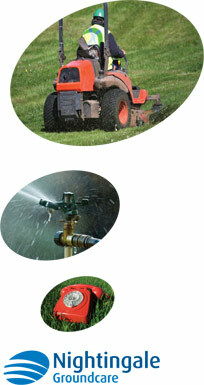 Lawn maintenance: The crowning feature of any garden or land is the grass. Make sure it's trimmed to perfection with our team at Nightingale Ground Care. If you'd like to find out more about our landscape gardening in Newbury by getting in contact with us today.